Duration Windows is proud to inform that all of our aluminium windows and aluminium doors meet with the required performance characteristics and from now will be CE marked accordingly, so as a customer or supplier to customers you can have complete peace of mind when purchasing our products glazed. It will however be your responsibility to CE mark any products that you purchase unglazed. CE Marking of external windows and doors from July 2013 will be mandatory in the UK for building products, in order to comply with CE Marking requirements. When the current Construction Products Directive is replaced by the Construction Products Regulation, most external windows and door sets will need CE Marking and it's the responsibility of installers, fabricators and suppliers to comply. Compliance is already a legal requirement for manufacturers to place their products on the market in some EC countries. From July 2013 manufacturers wishing to export to any Member State will be required to meet the regulations and their products bear the CE mark. The CE Mark shows that supplied external windows and doors are declared compliant with required performance characteristics, in addition to health, environmental and safety protection requirements of the aforementioned harmonized product standard. The installation of an external window or door as of July 1st 2013 without a CE Mark will be determined as an infringement of Construction Product Regulation requirements, and as a consequence you may be faced with having to remove any product without the CE Mark, and replacing it with an approved one. In addition, this may also result in criminal sanctions being taken against the Company making the window / door available for sale, within the market place. Local Authority Building Control and Trading Standards have made it clear they will be making sure all new doors and windows carry the CE Mark. In practical terms, any external door set supplied and installed after July 1st 2013 that is not CE Marked will potentially be sold illegally. If you buy in the complete product, i.e. frame, glass/panel and hardware from one source, then you do not have to worry. In this case the manufacturer, i.e. 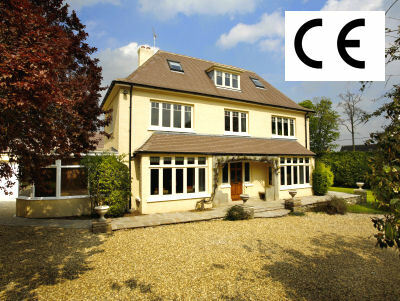 Duration Windows, will be fully responsible for providing the CE Marking. However if you purchase the glass elsewhere then we cannot CE mark the product as we are unable to guarantee beyond reasonable doubt that the product complies with all of the required standards. In this case, it will be up to you to comply and CE mark the product accordingly. To check that you are compliant with CE Marking regulations click here to view Build Checks quick guide or contact us for more information.